We don’t pick favorites when it comes to homes we have sold, but there are certain homes that can’t help but stand out in your mind. Such is the case with 107 King Street in Westbrook. The listing started like so many others. A call from an out of state family member, needing to sell the estate of his parents. But there was nothing ordinary about this one. Jason Miller returned from his visit to the home befuddled. “Wait till you see it Diane” he said. We are used to seeing “dated” homes. 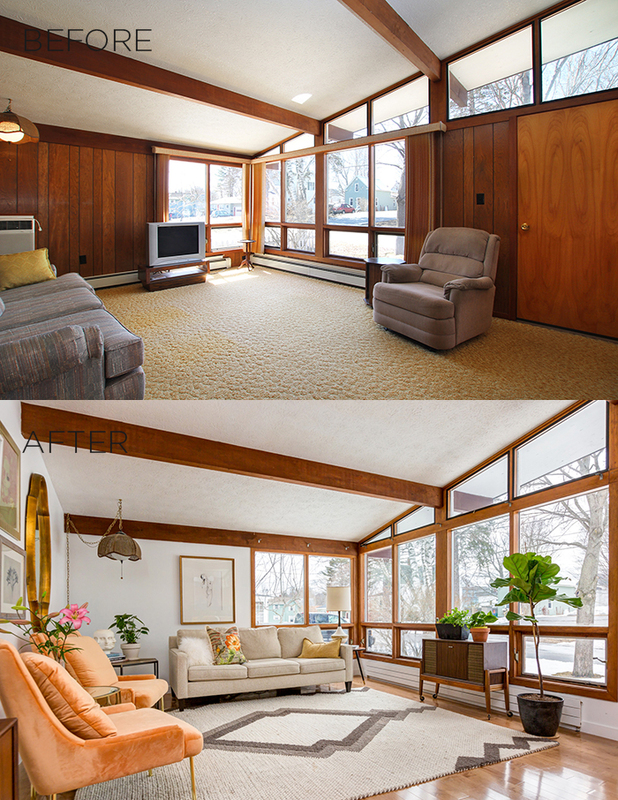 Wood paneling, old carpets… but this was something different. It was as if someone had closed the home up like a time capsule decades ago, and there it was, beautifully unchanged. But how would buyers react? We took the pictures, loaded it to the MLS, and held our breath. Within a half hour the phone started ringing, and ringing, and ringing. 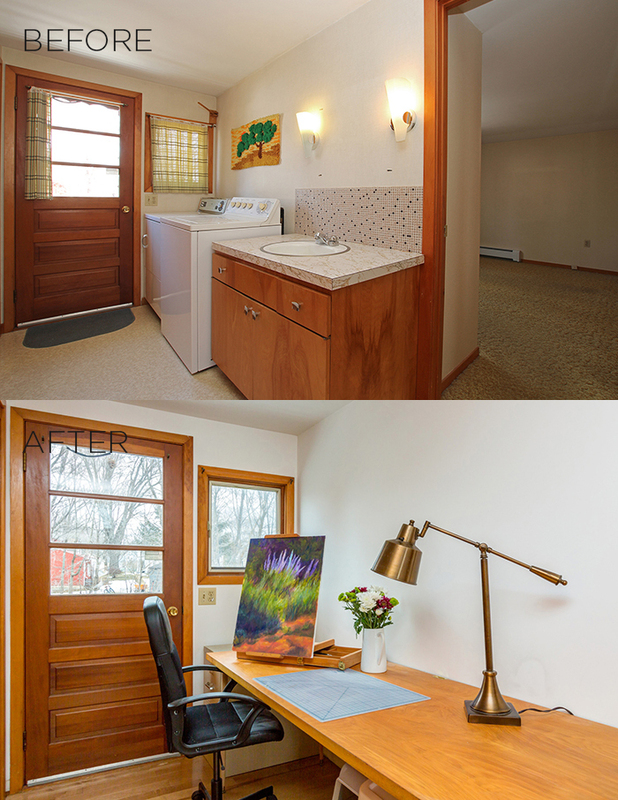 Showing upon showing upon showing. 5, 10, 15, 25 showings booked in just a few days. The offers started rolling in, 1, 2, 5, 6. We were thrilled, the sellers were thrilled, the home was a hit. We settled on an offer from a young architect. Who better to enjoy this unique home? Long after the home closed we still talked about the house on King Street. On a whim, I reached out to the architect to see how she was liking the house, had she made changes? Fast forward a few months and I found myself back in the kitchen of 107 King Street along with photographer Lynn Dube and John Rolfe from the Portland Press Herald. Jessica Carroll from Whitten Architects was kind enough to welcome us in to have a look at the changes and tell us about her experiences. 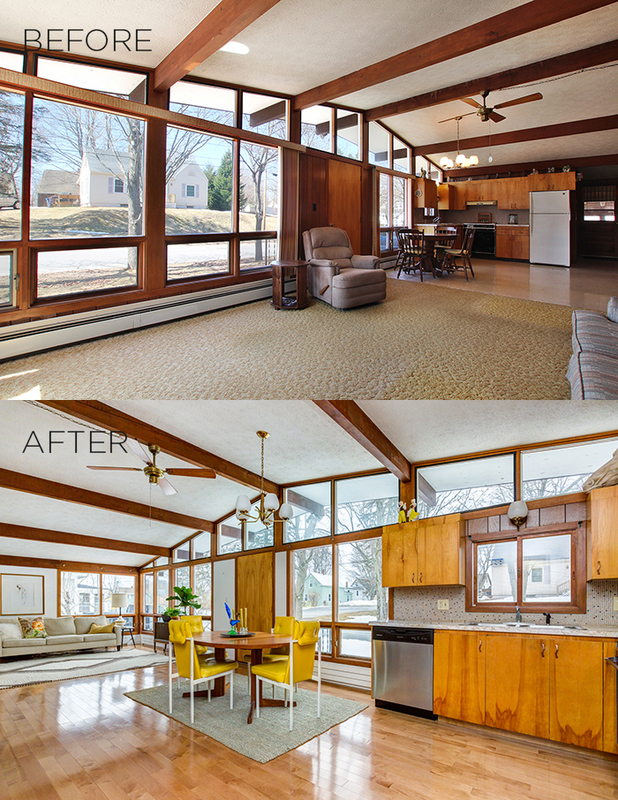 Let’s talk about what didn’t change, the wonderful exterior, the footprint of the home, the kitchen, the fanciful glitter laced textured ceiling, the solid wood doors, and the feel of the home. 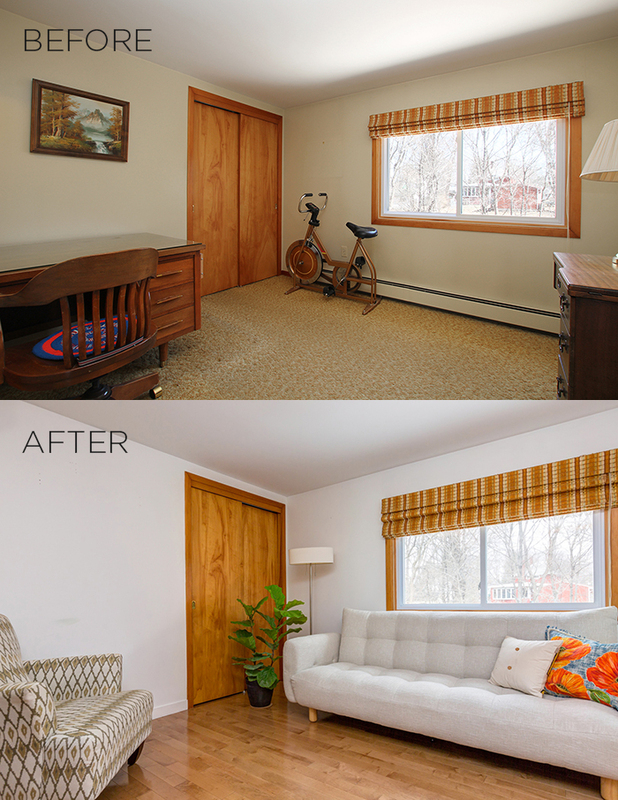 “You could feel the house was loved, I was really trying to respect that during the renovation,” Jessica noted her first change was the yellowish/greenish shag carpet, containing what she estimated as 50 years of dust. Now replaced with a gleaming maple floor, the change was dramatic. Also of note, the wood paneling is gone, replaced with white painted walls throughout. 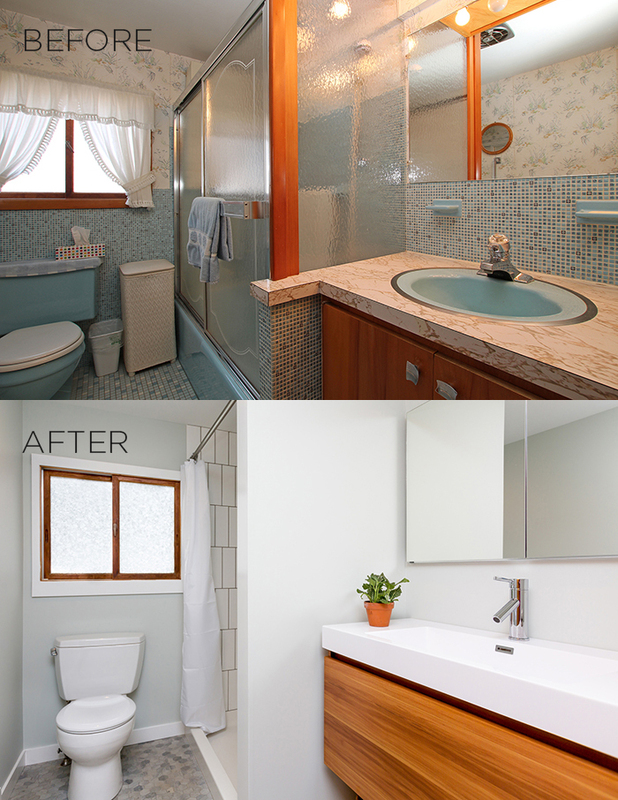 The once blue tile bathroom had just undergone its facelift. Now tastefully modern with improved flow, function and impeccable style. The lower level, perhaps undergoing the largest transformation, had every inch reworked for better livability and comfort. Many of the changes are unseen. The home required some serious foundation repair, along with updating electrical work and improving the insulation. The previous inhabitants of the home had left a few small treasures to discover. A few figurines now proudly displayed atop the kitchen cabinets, a hook rug wall picture still lives on the wall at the base of the stairs. Jessica found newspapers, notes, and family pictures in the walls. 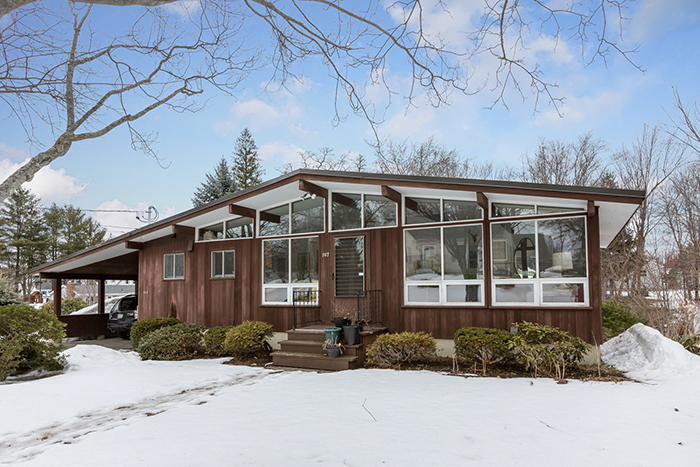 Jessica’s style and furnishings have kept the home tastefully mid-century modern. “The house knows what it wants to be”, Jessica continued, “you could see it when you walked in.” She buys many of her pieces at the Portland Flea for All and sometimes finds them on the side of the road in the West End, as was the case with the yellow dining room chairs. Selling your family home can come with mixed emotions. You want to know a new owner will love it as much as you did, and perhaps not change too much. After visiting the home of Jessica Carroll, I feel confident that the sellers and perhaps even the home, picked the perfect new owner to carry on the legacy and love at 107 King Street.